On April 15th, 2011, Ruslan scored an 8th-round TKO against Ivan Popoca, making ESPN’s Sports Center “Top Ten Plays of the Day” highlights. In 2012, he scored two major victories with a 6th round KO of David Torres on January 27th and a 2nd round KO of Jose Reynoso on June 29th. In 2013, Ruslan exploded in to the foreground, first engaging in a March 16th battle against Timothy Bradley for the WBO World Welterweight championship. Though it ended in a close and controversial loss for Ruslan, the fight went down in history and was deemed the 2013 Boxing Writers Association of America (BWAA) “Fight of the Year.” Seven months later, Provodnikov went on to challenge Mike Alvarado for his WBO Jr. Welterweight championship title in Alvarado’s hometown of Denver, CO. Provodnikov fought valiantly and won the bout by a technical knockout in round 10 of 12 when Alvarado did not get off the stool. 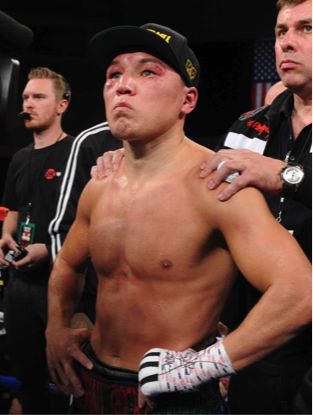 Closing out 2014, Ruslan Provodnikov fought in a huge homecoming fight on November 28th in Moscow, Russia, winning a 5th round stoppage over former world champion Jose Luis Castillo. The fight marked the first time Ruslan had fought in his home country in over 7 years, and it garnered a sold out crowd of local fans. Ruslan was cut early from an accidental headbutt and fell behind on the scorecards. In true “Siberian Rocky” form, Provodnikov stormed back in the 2nd half of the of the fight. He hurt Matthysse badly in round 10 and almost knocked the Argentine slugger out. Unfortunately, Ruslan came up on the short end by a majority decision score of 115-113, 115-113, and 114-114. For his 4th consecutive fight on HBO, “The Siberian Rocky” Ruslan Provodnikov garnered over 1 million viewer—averaging 1.243 million viewers and peaking at an outstanding 1.380 million viewers for the bout, which is now the leading candidate for 2015 BWAA Fight of the Year. Ruslan fought against undefeated Jesus Alvarez Rodriguez in a fight that took place on November 7, 2015 in Monte Carlo, Monaco. Provodnikov dominated the fight for 3 rounds and knocked Rodriguez out in the 4th. “The Siberian Rocky” fought under the guidance of his new trainer Joel Diaz, who has provided a fresh start for Ruslan. In his last bout, Ruslan dropped a hotly contested unanimous decision to former world title challenger John Molina, Jr. The fight took place on June 11, 2016 at The Turning Stone Resort Casino.